First of all, I would like to thank Grado for sending me out the GR8’s for review. It has been a long time that I have them now, and haven’t proceeded in writing the review, as I have given them a chance to be compared to other earphones I own, and more so, for other people to give them a try, and let them give me their opinions on them too. The GR8’s come in at quite an expensive price, at £280 for a moving armature driver earphone, one could buy a triple BA driver from Shure, or even Westone. So let’s see how the Grado GR8’s compare! The packaging of the GR8 is very elegant. It is golden looking, and is quite nice and small; the opening of the case is very nice too. Overall, the GR8’s packaging is very nice and elegant. The accessories of the GR8 let them down quite a lot. There is only a set of small and large silicone tips provided, alongside the medium sized silicone tips that are already on the earphones. From an expensive set of earphones, let alone from a prestigious company, such as Grado, I was expecting much greater things. I felt extremely disappointed not to find another thing there – I mean even a set of UE350’s price at around £35 had more accessories. Overall, my first impressions were a let down. I was expecting such great things to be included in the package of the GR8, especially with all the praise the Grado’s get worldwide for their headphones. The build quality of the Grado GR8’s is reasonably good, however I don’t feel the earphones will last a lot of abuse – as the wire is quite thin, the jack is terminated with a 3.5mm gold plated straight jack (which bends very easily), and the GR8’s have a lack of strength by the housing. 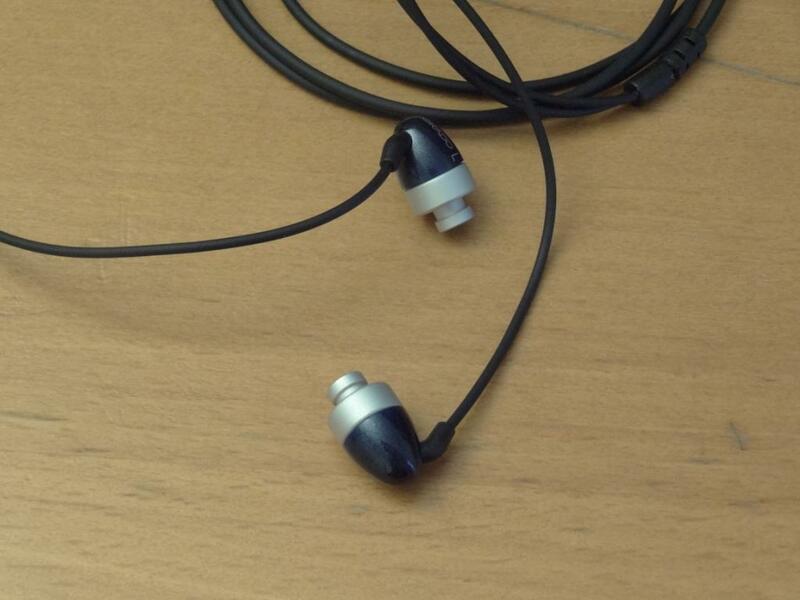 By that I mean the strain relief by the housing of the earphone feels a little weak, and isn’t very sturdy. 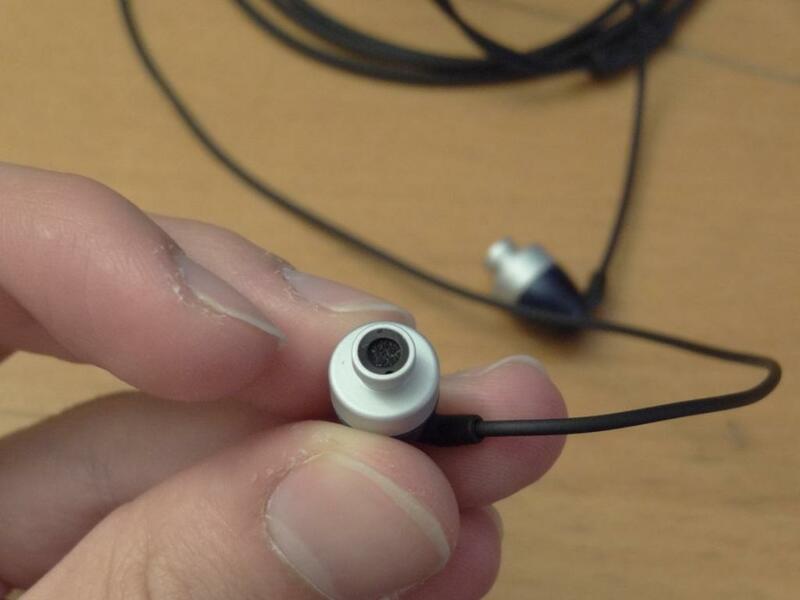 The housing of the earphones themselves is good, however there is a little space between the blue and silver part of the earphone housing, which leads to dirt getting in there. The finish of the housing is very nice, it isn’t too distracting, but neither is it boring. The finish reminds me of a marble/granite-esk finish. 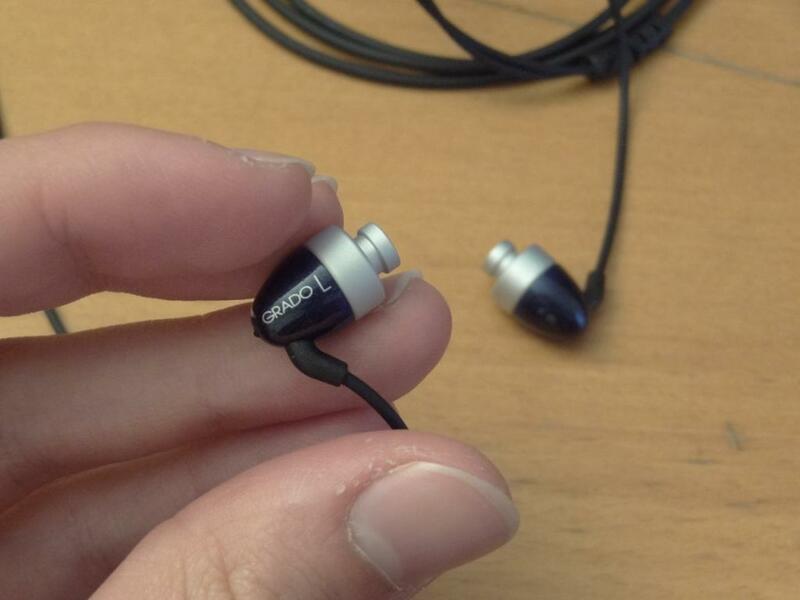 The microphonics of the Grado GR8’s are almost non-existent, especially when worn over-the-ear. 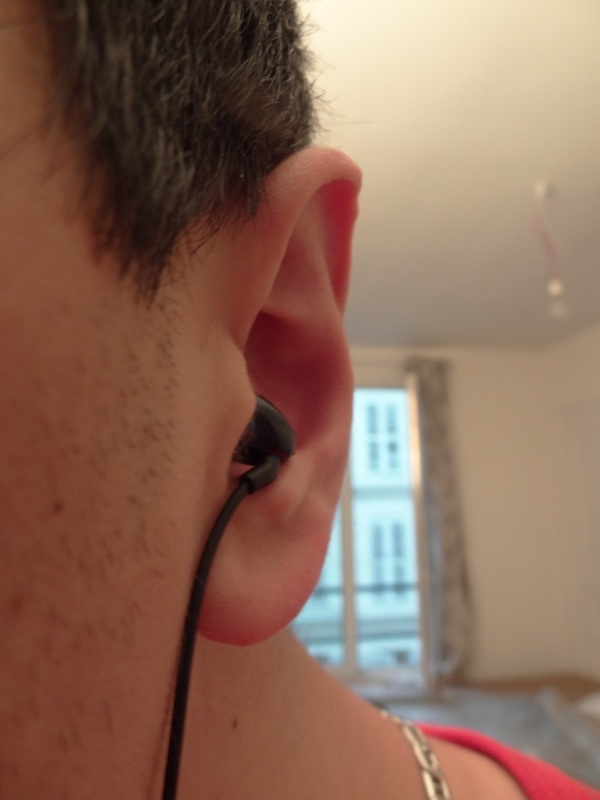 The GR8’s can be worn both straight down and over-the-ear. 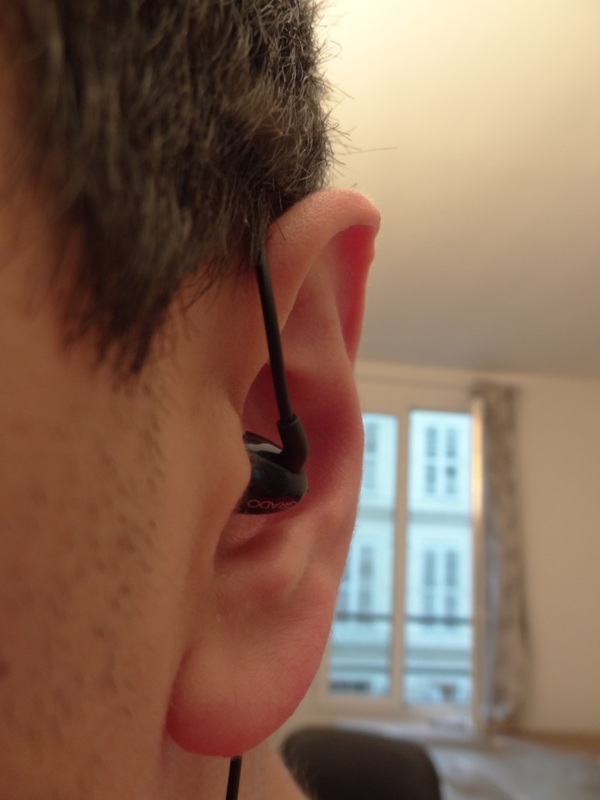 I personally found it more comfortable to wear them over-the-ear, as the isolation was better, and the fact I have gotten used to wearing them like that, meant that I didn’t really feel uncomfortable wearing them like that. Overall, the build quality is good, and above average, but I wouldn’t hold my bets in keeping the GR8’s for several years of use. 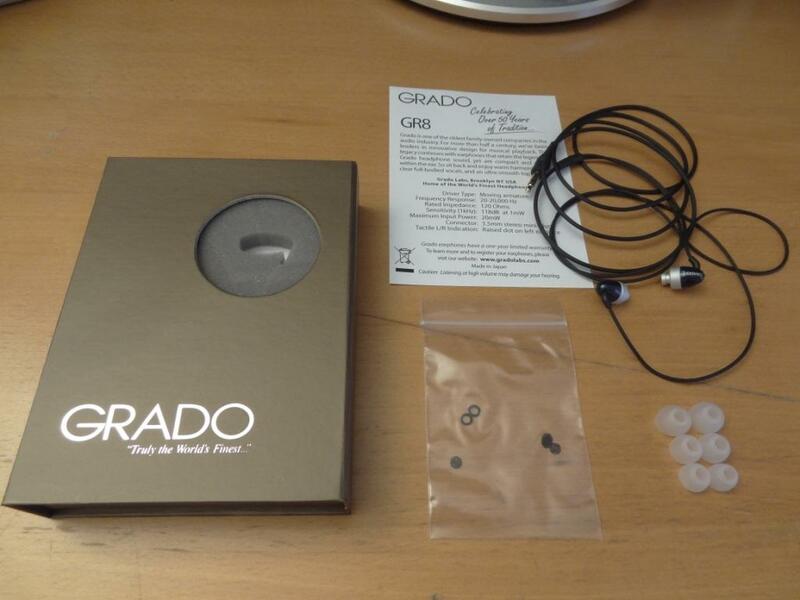 The look and the design of the Grado GR8’s is very simple and very nice. I found the design to be very simplistic – it isn’t anything revolutionary, and looks just like your ordinary universal fitting earphone. What I really like in the look and the design, is the attention to detail on the paint work on the housing of the earphones – as mentioned beforehand, it is blue with a granite/marble finish, which looks very classy and very elegant in-ear. The isolation of the Grado GR8’s is quite good – I found that the isolation is better when the GR8’s are worn over-the-ear, rather than straight down. I think this has to do more with the way the GR8’s cover more of the ear, whilst worn over-the-ear, rather than anything else. 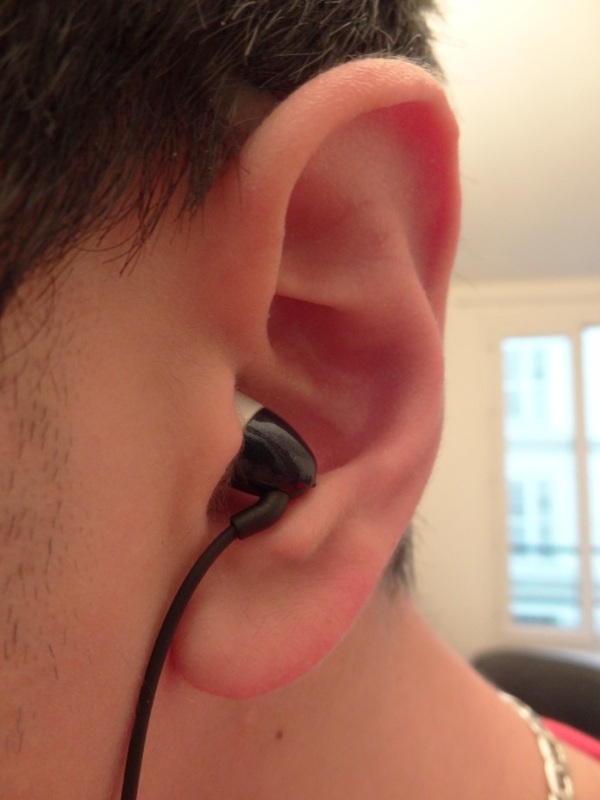 The comfort of these is good, however when the GR8’s are worn straight down I felt that the earphones often felt like they wanted to pop out of my ear (and before you go ahead and say it, no it isn’t due to incorrect tip selection) – I found it didn’t stay well in my ear. 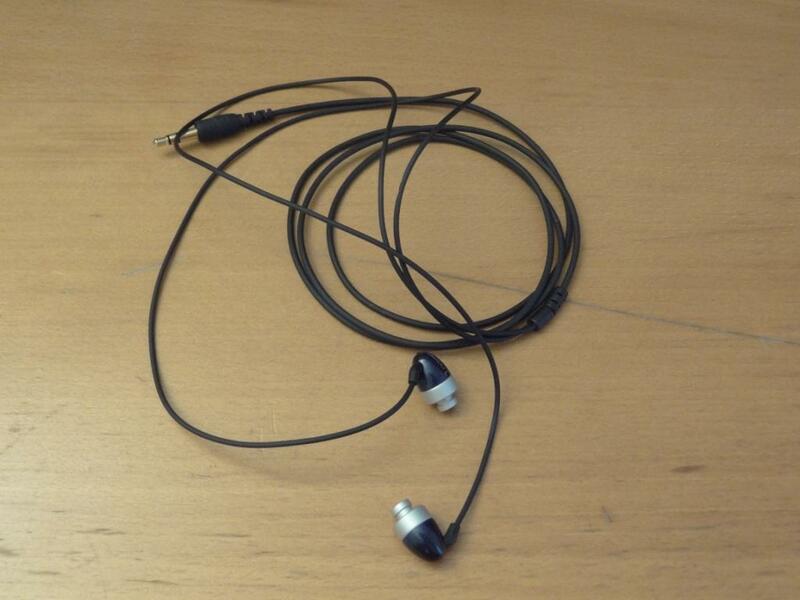 However when worn over-the-ear (with the same tips), the earphones were comfortable, and stay in my ear pretty well. Due to the very light weight of the earphones, I found these earphones extremely comfortable to wear, it felt almost like they weren’t in my ears at all, whilst they were in. The sound quality of the GR8’s is what I was expecting to pull up the rest of the relative negative impressions I had of the earphones. I however found the sound quality to be almost as bad as the amount of accessories provided, and when compared to earphones in it’s price range, the GR8’s didn’t even stand a chance. Not at the near £300 mark, nor the £200 mark, and if anything really stood a chance and could compete with earphones at the £50-100 mark. The Grado GR8’s at the price were not impressive, but with price taken out of consideration (how I usually rate my sound quality ratings) it came up as an above the average earphone. The lows, as expected from a armature driver, wasn’t great. Just like the PFE 112’s they had a missing emphasis on the bass. However, that said the GR8’s felt like they were moving a bit more air than your normal BA driver. This is were the moving armature must be playing its part – by moving, and creating more air, it provided more quantity of bass. Note how I said quantity, but not quality. The quality of the bass wasn’t great, as it didn’t extend low enough for me to enjoy some basslines. I felt like the bass was rolled off quite a lot of the time, and more so, the GR8’s felt like they had literally no sub-bass response. The mids and highs, at first impressed me. However after several weeks of comparing with other earphones, such as with the likes of PFE 232’s at my disposal, I found several flaws with the GR8’s. The highs, for starters felt like they were rolled off at the end, and didn’t have that much sparkle. I was often left wondering if they would have some sort of after-burners to them, to give me that extra bit of detail I was looking for. However, that was never to be – it should be noted that the GR8’s highs are good, but definitely not what I had in mind of an expensive set of earphones, from a prestigious audio company. The mids, unlike the highs, were hard to pin down; It was not only when I compared them, by almost A/Bing, with the PFE 232’s were I found the flaws of the GR8’s mids. I could hear the mids as being almost unnatural and washed out – I know they are supposed to be as flat as possible, but I didn’t feel that, that what I was hearing was neutral or flat, but more like there was a dip in the mids, causing the mids to sound a little “off” to me. The soundstage of the GR8’s was surprisingly good, especially the music separation. That said, due to their small size, I felt the soundstage wasn’t truly wide. Overall, for the sound quality aspect of the Grado’s, I was very disappointed, especially as so many people rave about their headphones. As I haven’t tried their headphones (might one day demo them), I can’t comment on their headphone range, but based on the GR8 earphones, I doubt I would go out and actively seek to buy any of the Grado products. That’s unfortunately my honest, but harsh opinion of them. I thus can’t see myself ever recommending these earphones to anyone, be it for mids, highs, or lows, as there are a lot of other, better, alternatives out there. Especially for the high price tag. This entry was posted in Audio Reviews and tagged GR8, Grado, Review on August 19, 2012 by TotallydubbedHD. 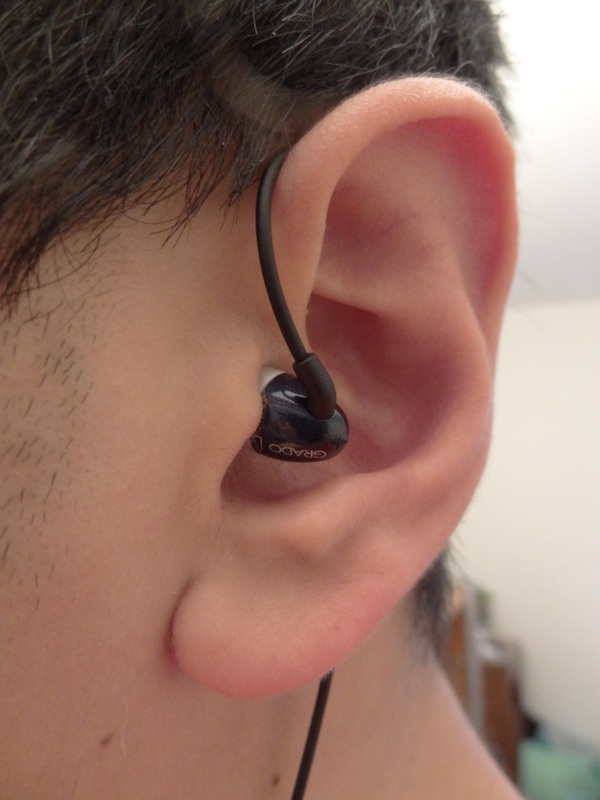 You should try and get a pair of e-Q5’s for review because they blow the GR8 away. You’d think because they both use a moving armature that they’d sound somewhat similar but they don’t. The e-Q5 has better over all detail and the soundstage is so much bigger it makes the GR8 sound very closed in. I’ve heard a few other top-tier IEM’s like the W4, FX700, SE535, EX1000 along with a few others and the e-Q5 sounds every bit as good as they do. To be able to get a top-tier IEM with great SQ and a large soundstage for only $200 makes these one of the best values in the IEM world imo. Love your reviews so keep them coming dub. Thanks for the great input Techno Kid! I have yet to hear the w4s, ex1k, fx700s or even the eq5! I shall keep reviewing :D!